Gaming invokes our inner child and allows us to indulge in our fantasies. No matter where we are, with who we are and even if we have no company, gaming is surely one of the best forms of entertainment. For some, gaming is a source of entertainment, some play it to kill time and for some it’s more than an obsession. When talking about gaming, it’s impossible not to mention Nintendo Switch. Nintendo’s Switch has surely become talk of town especially in the gaming industry. The ease of use if offers, makes it an incredible platform to enjoy games on our television set, and that too in high definition picture quality. So if you just got yourself this fun gaming console over the holidays, here are a few tips that’ll help you to make the most of this action packed gadget. One of the biggest disappointments while playing games is when your friends or family members interrupt in between, messing up your so far earned gaming progress. So, if you don’t want them to interrupt in your game stages, here’s what you can do. Open System Settings > Users > Add User. 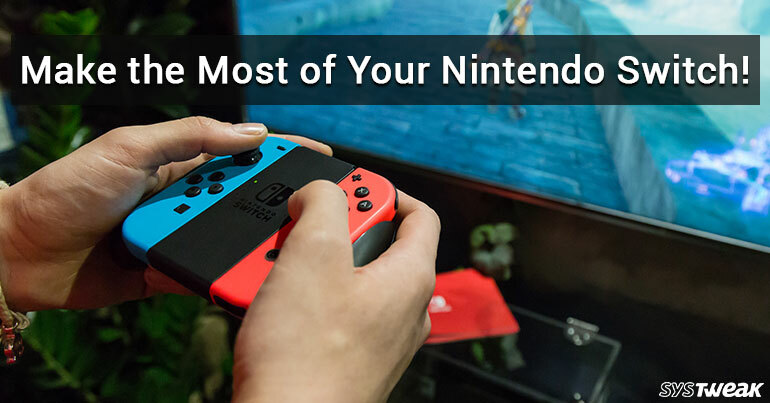 Each user gets to save their own gaming history and this makes it pretty easy for you to share your Nintendo Switch with your friends or family members. We don’t really realize it but gaming can get you glued to the couch and TV set for long hours. To see how much time you have invested in playing each and every game you can monitor your activity feed. Tap on a user’s profile icon from the home screen and then select “Profile” from left menu bar. Games are wrapped in big bundle of Gigabytes. No matter how much you get, there’s still plenty of room for more storage. To manage your Switch’s storage head on to System Settings > Data Management to make some more room for storage. Here you can see the exact amount of space taken up by each and every game along with along with their exact storage location whether they’re saved on internal memory or SD Card. At anytime when you feel like capturing a quick screenshot of the game play here’s what you need to do. On the left Joy-Con just below the direction pad, hit the square button with a circle in the middle of it. This will instantly save the screenshot in the gallery if you wish to store it for future reference. The joy-con controllers of Nintendo Switch are pretty small and get easily misplaced. Well, thanks to Nintendo’s advanced software finding your lost controllers just got easier. On the home screen, select the Controllers icon followed by Find Controllers. This will display a list of all nearby controllers, select the misplaced controller from the list. The respective controller will begin vibrating and you can easily locate it without any hassle. You can easily edit and customize your Nintendo gaming avatar aka Mii. for that you’ll need to go into System Settings > Mii > Create/Edit a Mii. To explore your friend code, go to the activity window and tap on Profile option from the left menu bar. Once your profile appears on the screen, you’ll find your code right below your profile picture. You can use this code and send it to your friends so that they can add you on their list. So fellas, here were a few tips and tricks to get started with Nintendo Switch. If you have any other queries feel free to hit the comment box. Watch this space for more such updates! iPhone X: Is It Even Worth It?